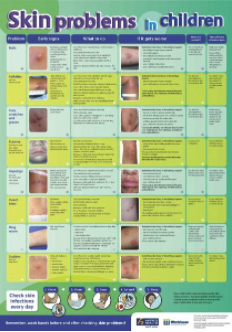 A poster with information about a range of skin conditions comparing early signs; what to do; what to do if it gets worse; how it is spread; time off from school or kura. The poster lists information about each condition: early signs; what to do; what to do if it gets worse; how it is spread; time off from school or kura. This page last reviewed 15 April 2019.